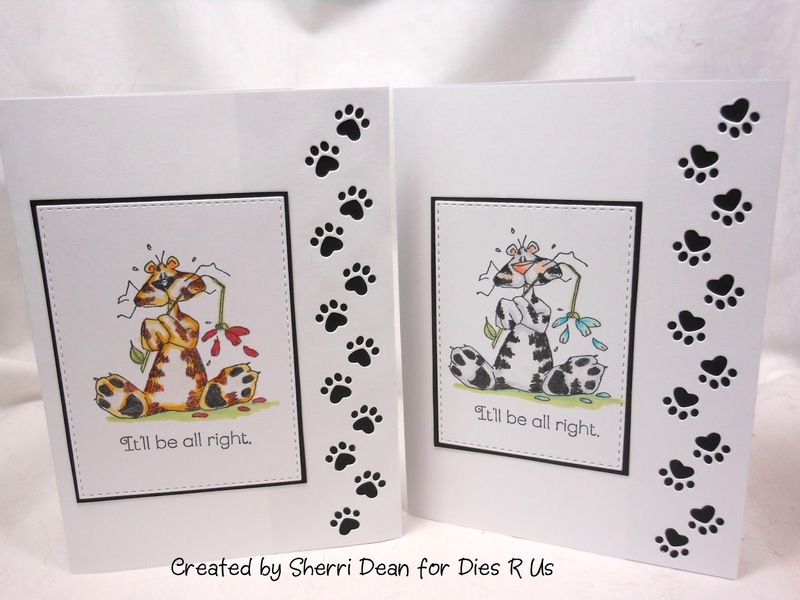 Dies R Us: "Pawsitively Perrrfect!" I hope you are having a wonderful week! I'm also hoping I can add to it by sharing a new die I just got that I am "pawsitively" in love with! (I know, I say that a lot!) 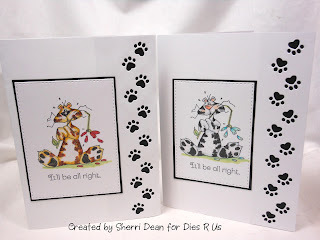 If you are like me and love anything connected to our four legged fur-people ( cats AND dogs) then you will LOVE the Frantic Stamper Reverse Paw Print Border die! The minute I saw it, I decided it should come home with me and from the minute I opened the package, I have been having the most fun creating all kinds of cards. I pulled out my Memory Box Stitched Rectangle Layers die (an absolute MUST have!) and created my first birthday card with it. 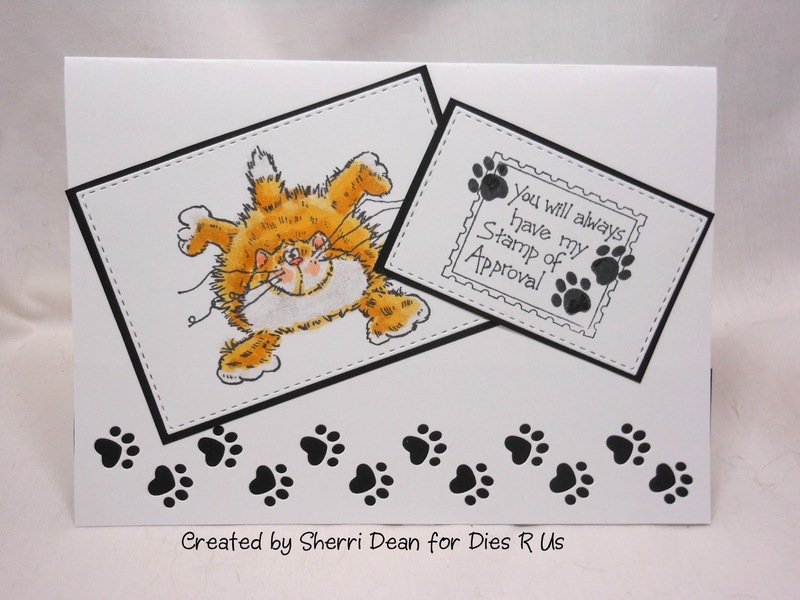 The cat is a Penny Black stamp and the sentiment is from Great Impressions. Next, I decided to make a couple of get well cards with a favorite Judith stamp. I think either of these would bring a smile to anyone under the weather! And finally, I pulled out another Great Impressions stamp for some additional birthday greetings. 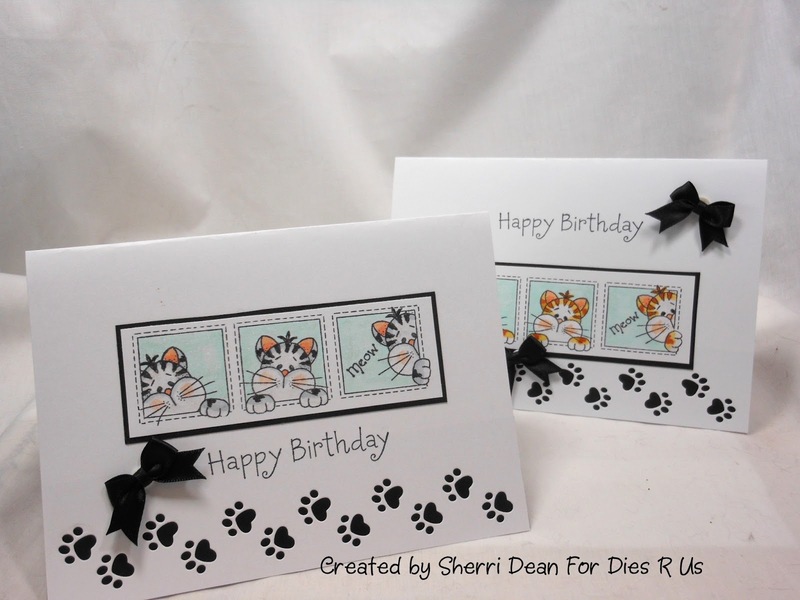 Anyone who loves cats would be thrilled to get these cards. If you are more in to dogs than cats, you can add your favorite doggie stamps for the same awesome results! 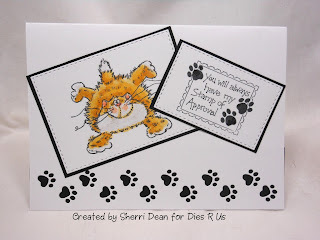 Be sure to hop over to the Dies R Us Challenge Blog! A new challenge just started on the first and you could be the lucky winner of a gift voucher to the amazing store! Low, low prices, low shipping and absolute best selection of dies, embossing folders and stamps you can find anywhere! Be sure to check out the rest of our awesome inspirations as we have a new posting every day Monday through Friday! Our designers are sure to give you lots of ideas!